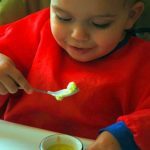 I am often asked what “tricks” I have to get my toddler to eat well, or how I cope with food rejection and other issues at the table. Trust, Respect, Model, Accept, Slow Down and Enjoy. Probably because of my family and cultural background (French), I was confident in my approach to food, and introducing it to my son felt natural. 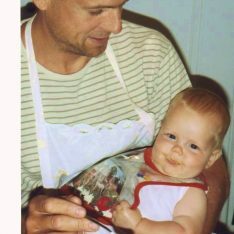 As I learned more about RIE (thanks to Janet), I realized I was applying a lot of the major principles of respectful, mindful parenting to my attitude toward food and mealtime with my toddler. Since my son was an infant, I have trusted that he knows what his body needs, and that he is capable of determining how much of a food he should eat. 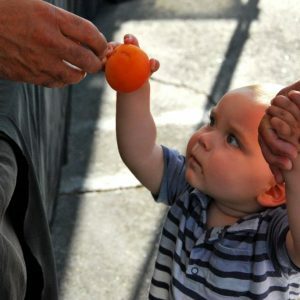 I trust and know that children do not starve themselves. So I offer a variety of nutrient-dense, flavorful foods in reasonable quantities, letting him decide how much to eat, and at his own pace within the boundary of mealtimes. Just as we don’t direct our child’s play, but rather trust him to choose activities that he needs in the moment, we should not direct our child’s eating, but rather trust his body. Our trust teaches our children to trust and listen to themselves. Embracing this trust helps relieve the stress, anxiety or even panic of meals (is my child eating enough? Will he like what I make for him?). In this relaxed, stress free environment, children start to create positive associations with meals and food. This trust has benefits, as well. As we trust our children and respect their desire or refusal of a food without drawing conclusions (like “He hates my cooking”, “she hates all vegetables”, “he’s picky”), we create an open-minded, safe, food environment, conducive to trying new things and hopefully stimulating curiosity about food. Because many factors can be part of a food rejection — growth, teeth, mood, testing, agitation, fatigue — and not just a true like or dislike of a flavor , the key is to re-offer foods a number of times. If the rejection is repeated, then to try again a few months later as tastes evolve. I have applied this consistently with my son since he started solids at 6 months, and while he has some preferences, I’ve found there’s virtually no food he actually dislikes. Respecting our children also means avoiding labels. The same way I find it limiting and unfair to label a child as “shy” if she’s being quiet, I don’t see anything positive in labeling a child as “a picky eater”. Such expectations tend to be self-fulfilling. If our children are not be in the mood for a food a certain day, it’s not to be taken personally. They’re not rejecting us or our hard work in the kitchen. They’re not being ungrateful or difficult. They’re listening to their bodies. …not to be underestimated. 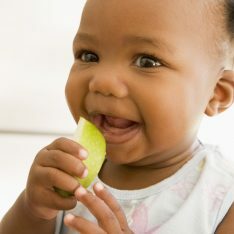 He’s capable of enjoying vegetables and all kinds of (age appropriate) foods. Being open and paying attention to our baby’s reaction to foods and putting ourselves in her shoes is also a fulfilling and fascinating exploration as a parent: to imagine what it must be like to taste a food for the first time. Narrating and sharing that back to them plants the seeds of mindful eating. If a toddler shows interest in the kitchen, share what you are making, look at recipe books together, talk about ingredients, include them in the process and they will feel empowered and engaged. Much like the best toys aren’t kids’ toys, the best foods aren’t kids’ foods. The idea of “kids foods” (this preconception that children naturally only like fried foods, sweet processed foods and pizza), or hiding broccoli and kale under a mound of pasta, lying about the presence of a vegetable, or even sweetening a baby food puree because we assume children only like it sweet, is disrespectful, a form of “dumbing down” that often is self-fulfilling. Modeling a healthy, joyful approach to food and our bodies: Being engaged in the enjoyment of food preparation and meals, being willing to try new foods ourselves, listening to our bodies and slowing down to experience food, seeing the family meal as an opportunity for connection and togetherness where everyone is an equal member and participant. Nurturing a healthy, joyful, positive relationship to the nourishment of our bodies is a key element, and responsibility, of parenting. The dinner table can be a powerful place to model interacting with each other in a respectful manner, a mini version of life in society really. 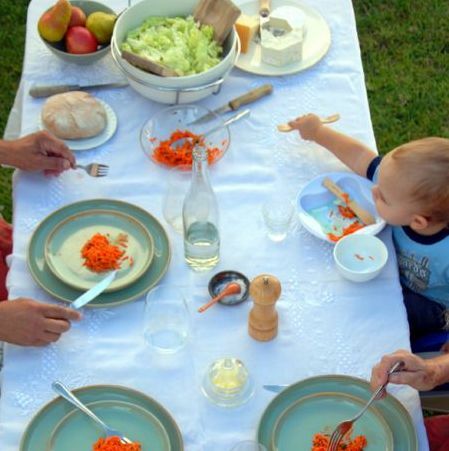 The family meal can be an opportunity to practice and model being in the moment with our loved ones, taking turns, sharing, listening, exchanging stories and thoughts. You know, the human experience. …and acknowledge feelings. Don’t rush to fix them. One of the things that help a child listen to his body and eat well is giving him an opportunity to feel hungry. I find that having clear limits on snacking improves the meal experience greatly. This may sound controversial, and many moms have a hard time saying no to a child asking for a snack. The instinct is to rush to satisfy that request for fear of the child sensing hunger for even a minute. I trust that my child is capable of patience, of the pleasure of anticipation. I am ok with his feelings, and know he will benefit from this self-awareness. Eating mindfully, without distractions, as an end in itself, as a moment to enjoy and focus on. Talk about the food we eat, the flavors, the sensations we experience. Slow down and enjoy the togetherness of a meal. In our busy lives, the meal can be a moment to be completely present with our children and enjoy a shared experience with them. …thanks to self-care and clear boundaries. Because the table is an obvious place for children to test what they can and cannot do, self-care and clear boundaries are key. I cannot enjoy my meal if my toddler is walking with food around the house, throwing food or dipping his toys in the salad dressing. My 2 ½ year old son recently tested this boundary. He wanted to leave the table to go play. I explained we must be at the table to eat, so if he’s still hungry, he should finish now and go play after. The meal is there for a given amount of time, then the meal is over and we clear the table. “If you want to go play right now, you are telling me you are no longer hungry. I will put your plate away.” He decided to go play. I did put his plate away, and we continued eating. He came back 20 minutes later asking for his plate. I explained I put it away. I acknowledged his frustration and disappointment. Since we were at the cheese or fruit course, I did offer him a small piece of cheese or fruit if he was still really hungry. But he insisted on getting his plate back, which really showed me this exchange had nothing to do with food and hunger, but everything to do about his getting a clear answer on where the boundary stands. These approaches are self-fulfilling because they create good associations with food. So changing or adjusting our perspectives as parents, with patience and trust, is so rewarding: instead of being synonymous with power struggle, fear, stress, manipulation, and isolation, our children will learn to associate food with pleasure, connection, and nourishment of body and soul. Helene is the French mom of almost three year old Pablo, living in Los Angeles. Her blog, French Foodie Baby, chronicles her journey in the nurturing and expanding of her son’s tastebuds and love of life through good food. It includes baby and family cuisine recipes as well as musings on parenting, cooking, and the many life lessons learned in the kitchen and at the table. This was enlightening. Thank you, Helen. I thought “no dessert till you eat your veggies” was a good limit but I guess I can see how this would be manipulative and create a bad association, yes? So, can you give dessert, first, then, if your child is not into the kale [which they like, too, by the way]? Yes, we also eat in courses so our daughter has to wait. We would just leave her dinner plate out and she would go back to her main course. Now she’s a bit older we don’t really need to do that,she’ll eat most of her meal. My son was 8 months old the 1st time I offered him a piece of a real apple. He held it in his little hands an clumsily used his newly erupted front teeth to slowly crunch into the apple. Each time he bit into that apple piece he giggled with joy. Truly amazing to watch him experience tasting an apple for the 1st time. What a beautiful gift your son gave you 🙂 Thank you for sharing! this is so good! i also saw a link between the French parenting books i was reading and the R.I.E. philosophy. they do seem to go hand-in-hand in a lot of ways! i do believe that the highly processed, sweetened “kids” food we give to our children keeps their taste buds from maturing and appreciating all sorts of flavors. people are amazed that my 3 yo loves fish, seaweed, brussels sprouts, etc. it’s just her “normal.” she doesn’t snack much so she is well aware of the sensation of being hungry. she ‘s learned to wait. and of course, as the French say, “hunger is the best sauce.” it makes everything taste good!! i completely trust her. the few times early on when i pushed her to eat more food at a meal when she didn’t want to, she ended up vomiting after. she just didn’t need more, and her body was telling her no. i should have listened! My 2.5yo Pickle eats really well, but has started wanting to leave the table & return… I have put his plate away & endured the tantrums on the few occasions, though have admittedly slipped on occasion & given in to him. Your post has encouraged me to stick with it. The only food I’ve discovered he doesn’t like so far is passionfruit! Vegetables, fruit, dairy, meats, even fish roe he has enjoyed… I have to ration olives! Ah yes, children can really call our bluff, can’t they 😉 I can relate! And of course my first thought when reading the second part of your comment was, “Don’t give up on the passion fruit!” 😉 Sounds like your little one has quite a palate already though! Hi, what do you recommend if the child wants to leave dinner table early to go play then decides he/she is still hungry an hour or two later please? Would you let him/her go to bed hungry? What if they wake up middle of the night wanting food? Thank you so much for the tips! I appreciate the thorough reasoning and find it to be a great elaborate version of the division of responsibilities from Ellyn Satter guideline. Hi Yao, I have had this very experience with my son, and often have found that it is not about being hungry, but about checking whether I’m going to hold my boundary. 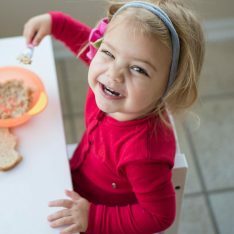 Chances are, if mealtimes are at set times, and with limited snacking, if a child leaves the table, he’s probably just not that hungry, and can probably hang until the next meal. If my son told me he was really hungry after the meal, I would offer something small, like some apple, or a few blueberries, or a small piece of cheese or whole fat yogurt (fat does tend to help feel full longer) and say, “If you are feeling really hungry, this is what you may have.” If he’s really hungry, he will take me up on that. The key is to remain calm and observe your child’s reaction to your holding the mealtime eating boundary. Try and see if he does wake up at night… If his weight is normal and his other meals during the day have been normal, he should be able to get through the night. I’m so excited to see Helene guest posting here (French Foodie Baby is a great site)!! I recently wrote about food strikes in babies who are just beginning solids – my now 11 month old seems uninterested in food when she used to be so adventurous – and these principles completely apply in that situation as well! Thank you for sharing your thoughts and experiences with Janet’s audience! What do you say when they don’t eat any dinner or much at all for several days on end and want dessert. It’s not that I’m saying no to bribe her. I’m saying no because of all the food that goes into her body, healthy growing foods have to be in the larger percentage. -if she refuses the savoury part, I never say “no dessert then”, nor do I offer double dessert to compensate. My own mum tended to do the latter, which probably didn’t help. -my daughter is still not fully verbal so she doesn’t say “I hate broccoli” but there is the odd day when she won’t touch them. I don’t take it as she now dislikes them, and usually the next time broccoli are on the menu, she eats them. -ever since she has been self-feeding (at about 18 months), we have been having all meals together as a family and she likes to eat what we eat. I think your post is excellent. I’m glad Janet published it. Loved this! I especially loved your explanation for holding boundaries (I have a lot of issues with that!). We have been guilty of using sweets to pacify and distract with my 3 year old son, and I am trying to correct that. I wonder, though, about the addictive quality of sweets and sugar. Do you have any suggestions for improving his habits? I am a nanny and my charge just turn 12 months old. She has been eating whole foods three times a day as supplement after her formula (breakfast, lunch, and dinner). She pretty much eats what we eat. I cook dinner twice a week for the family, and know I will be cooking more as now we have a toddler in the house. My question is, are the recipes by ages on your blogs work for adults, too? I would like to make meals that can be enjoyed by the entire family, instead of making something separately, like meal for the adults, and meal for the kid. I really love your approach to meal times and appreciate your advice. I’ve also felt it was normal to offer my son a plate of food and let him decide on when he’s done. As a child I was often forced to eat things I didn’t like/enjoy and as result I had a poor diet as a teenager and young adult. With that being said, I’m starting to experience more struggles with trying to get my son to try new foods. He’s 2.5 yrs old, and there are only a small number of different meals/snacks that he really enjoys. He recognizes different foods from books (cucumber, carrots, bread) but he refuses to try them. If he at least tried them and didn’t like them, I could accept that. But he refuses to even taste them. How can I get him to be a little more open-minded to at least taste more things. You’ve presented this topic so accurately…and coming from a fellow food blogger and mama of two, this resonates with me! I prepare everything fresh and follow a lot of the same ideals as you!!! What do we do if she refuses to eat dinner, or eats very little and then wants a glass of milk after – this has often happened and i kinda want her to eat some dinner before turning to milk. At the moment if she refuses dinner i offer her a choice of fruit and some water. Does this seem reasonable? It’s also tricky in the winter months too as you want them to eat well so that they don’t get sick. Thanks for the article. It reinforces everything that my partner and I have been doing with our son around food. And yet, at 2.5 years there were only four vegetables he would eat, and now at almost 3 years the only vegetable he will eat is raw carrot. He has recently shown signs of B vitamin deficiency (we don’t buy processed grain products which are enriched with vitamins). So now I’m starting to doubt my trust in him to know what his body needs… We’ve started giving him a liquid B vitamin supplement, but I worry that that will reinforce him not feeling inclined to eat those foods which naturally contain them. What should I do now, if I’ve already been doing all of the above? Hi, thank you for the article. It’s very insightful. Hi, beautiful article, thank you! I have boy/girl 8 month old twins and am wondering about teaching patience. During meal time, they both are aware of the “it’s time to eat” cues and anticipate eating with excitement. My son starts crying pretty much right away when he sees me getting ready to meal time and I find myself distracting with toys, etc. But I’m not sure that’s the best way to teach patience. Do you have any advice on ways to help him understand the food will come without him getting upset? Thank you! So it seems that you’re deciding what a “reasonable quantity is” and not letting your son decide that for himself? So how is that trusting him to determine how much of a food he should eat? I have the problem with my 1-year-old that she often throws her food on the floor when she doesn’t like it, or even if she’s just tired of it. I’ve tried saying simply “You threw your food on the floor, and that tells me you’re all done / not hungry.” and then ending the meal. But often it’s not that she’s full, but just that she wants something else and doesn’t know how to communicate that. If at that point I were to offer her a more preferred food (like fruit or yogurt or nut butter) she would gobble it up and ask for more. So I’m not sure what to do. Do I limit things like fruit and yogurt and nut butter so that she will have room for other things? Or do I serve the other things first and just try to catch her before she throws her main dish on the floor, then give her her dessert/preferred food? Also, we eat breakfast together as a family, but dinner is hard because she’s going to bed at 6pm, which means she starts her dinner at 4:45pm. Should I eat a snack with her at that point, just so she doesn’t feel like she’s eating alone? Thank you! This is very affirming. I will say that I struggle at times. My almost three year old has a very good palate, but it does take coaxing to get him around to his less favorite elements on the plate (especially around dinnertime, when he is perhaps most tired or perhaps less hungry). For instance, without my coaxing (not that I am pleased or want to keep doing it), he might only eat his unsweetened applesauce or whatever fruit is offered, and not want to dig into his meat, grains or vegetables. Sometimes I mix spinach or rice for instance into the applesauce and that is usually fine. But do you recommend I experiment with letting him only eat what he wants, even if it’s just the fruit element? Or should I stop offering the fruit element with the meal? I am more nervous about him going to bed without a full meal. I love this article. I know my 2 1/2 year old refuses to eat sometimes because it gets my goat! How do I deal with him choosing to get down because whatever I made isn’t what he prefers and then saying he’s hungry later? Or worse him being awake for hours in the middle of the night because he’s hungry because he didn’t eat dinner. Usually when he’s awake I have to be too. Ugh. Any ideas? Thank you for this article! I’m curious how you would handle toddlers who want second helpings (and thirds) of the least healthy portion of the meal? For example, our 4 and 3 year old will beg for more of the pasta without touching the chicken or green beans. Suggestions?